The world is ending. One by one the mighty cities are falling, to earthquakes, to flood, to raiders on both land and sea. (…) In the last shadowed days of the Age of Bronze, one woman dreams of the world beginning anew. This is her story. 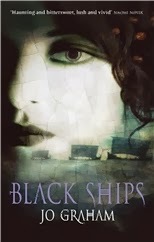 Black Ships is a reimagining of The Aeneid from the point of view of a young woman named Gull, an oracle and a servant of the Lady of the Dead who accompanies Aeneas and the exiled Trojans on their journey. We first meet Gull as the young daughter of a slave from Troy; when an accident severely hurts her leg and makes her unable to work in the fields, her mother saves her life by taking her to She Who is Pythia, the oracle at a temple a day’s journey away. Gull becomes Pythia’s apprentice and succeeds her when she dies — but what she initially imagined would be a quiet, secluded and predictable life serving her Lady in the temple is turned around completely one day when nine black ships appear on the horizon. Gull decides to accompany Prince Aeneas and the exiled men and women of Troy on their journey to form a new nation: we then follow them from a pirate harbour to the Egyptian Court to the caves underneath Mount Vesuvius, and finally to Latium and the seven hill of future Rome. As Clare says in her review, Black Ships is a perfect companion novel to Ursula Le Guin’s Lavinia: both approach Virgil’s epic from an unexpected angle, both explore little “what ifs” and hidden pockets of possibility within the original, and both add women’s voices to a story in which they aren’t prominent. All of these are among my favourite things for retellings to do, yet despite their similar sensibility and shared source material, the two are completely different novels. I liked Lavinia more only because of what Le Guin’s prose never fails to do my heart, but Black Ships is wonderful too. Jo Graham has certainly impressed me and I can’t wait to read more of her stuff. I knew from the very start that this was going to be my kind of novel: the check-list of elements that are basically Ana-nip includes the aforementioned female perspective in a traditionally male-dominated story; beautiful and unobtrusive writing; a refreshing approach to romance (more on which soon); and the skilled use of ancient history and classic mythology, which includes a loving and detailed depiction of the Ancient World that made me want to immerse myself in books with similar settings (Graham’s Ancient Egypt novel, Hand of Isis, sounds just about perfect right now. Also, maybe it’s time I give Mary Renault a second try?). I also appreciated how Black Ships combined a small-scale, intimate focus with a wider historical one. When it comes to the latter, this is a novel about people making sense of a period of enormous change. Our protagonist asks herself (and others) time and again why the great cities are falling; why there have been natural disasters like earthquakes, eruptions, and floods; why the relative prosperity of the Bronze Age seems to be coming to an end. These likely sound like inevitable questions — human beings have always asked why, after all — but Graham uses them as a point of departure for an exploration of how people cope with enormous changes they’re not yet equipped to fit into the wider narratives that explain heir world. Gull’s attempts to make sense of these changes are particularly interesting: she’s a Bronze Age priestess and therefore her understanding of the world is mainly mystical, which is something Jo Graham portrays with sensitivity and respect. At the same time, she’s an intelligent, intellectually curious woman who finds the wealth of knowledge she comes in contact with at the Egyptian Court absolutely breathtaking. Gull lacks the scientific knowledge to understand the movement of tectonic plates and how it causes eruptions and earthquakes, but her mind absolutely hungers for it — for what she’s always understood to be the knowledge of the Gods. On a more personal level, Gull is slowly coming to terms with the fact that being a priestess of death doesn’t mean she has to stand apart from life. The way her inward journey is approached in Black Ships put me in mind of Tiffany Aching and the Witches of Lancre in Discworld, all of whom understand the close links between life and death and what it means to be a witness to both. Last but not least, there’s the very refreshing romance: Gull is attracted to both Xandros, one of the Trojan exiles, and Prince Aeneas; and what could be a traditional love triangle becomes instead something we don’t get to see enough of in fiction. To clarify, what I dislike about the way some novels approach love triangles is the pressure the narrative puts on young women to pick a partner for life straight away (sometimes with the implication that this choice determines their very identity) and dismiss any feelings for other people as a shallow and passing distraction. Doubts, indecision, and simultaneous feelings for more than one person are depicted as immature at best and disreputable at worst, and these stories usually demand that women decide which set of feelings is “real” and which one is “false”. In Black Ships, Gull and Xandros become lovers and then lifelong partners. Their relationship becomes “real” day after day, over the course of many years, as they make the choice again and again to invest in and grow the connection they share. Gull isn’t made to decide from the get-go which one of these two men she cares about deeply is her “true love” — the question, if worth posing at all, can only be answered by the course her life follows over time. Additionally, Gull’s relationship with Xandros doesn’t require her to deny she has feelings for Aeneas — what happens instead is that Xandros tells her that these are feelings he too shares, and their mutual care for their dear friend, who could have been more for them both in different circumstances, only brings them closer to each other. So that was a lovely addition to a novel I was already inclined to really like. I had a wonderful time reading Black Ships, and as I said above I really look forward to returning to Jo Graham’s version of the Ancient World. Yet another reminder that I need to get this at the library next time I go! How does Jo Graham portray Aeneas, if I may ask? I love The Aeneid but it's hard to make Aeneas an interesting character -- he's dull AND sort of a jerk (cf Dido), and it makes you miss Odysseus. I'm sure you mentioned it at the time, but I can't remember -- what did Mary Renault do with her first chance? I always recommend The Mask of Apollo to Renault first-timers. It's friendly and accessible, more than some of her other books. Even though I love LeGuin, I've never tried Lavinia. I know, I know, I should, right? And now I'm adding this one to my list, which means I likely should have a peek at the original...which means this is suddenly a mini-reading-project, all from a single book you've mentioned. Your posts often have this effect on my reading list. Thanks, I think! I always meant to get around to more by Graham but as of yet I haven't. Wow, I hadn't heard of this previously, but it sounds beautiful! I'm definitely going to have to try and pick this up - if I ever get time to slot it into my to-read list. I'm particularly interested in looking at the love triangle, because I absolutely agree with you - nearly all of the time, it is handled without tact and subtlety. I would love to see it done well, as here. Jenny: I quite liked Graham's Aeneas - he's a Haunted By His Past kind of character, but not in an overly mopey sort of way. He's still sort of a jerk to this novel's version of Dido, but Jo Graham complicates the story in interesting ways (it's set in Egypt rather than Carthage, so there's lots of political manoeuvring and intrigue going on). Also, Gull really likes him, so her perspective endears him to the reader. As for Mary Renault, it wasn't anything terrible - I just tried Fire From Heaven last year and couldn't get into it. Eventually I was lured away by other shiny books and put it down after a few chapters. But I really, really want to like her and I shall give her a proper chance this year. Also, you're no longer alone in your love for The Charioteer! Fence: I was browsing through my archives the other day and it's funny how that works. Some books I read five years back I feel I read only yesterday; others ages and ages ago. Lulu: I don't want to be unfair and generalise too much about love triangles or anything - I'm just not uncomfortable with how some stories frame romantic choices made by young women, and with the double standards that are often left unexamined. So it was really lovely to come across something completely different. Anyway, I hope you enjoy this if you get around to it!